Continuity mistake: In the scene where Dewey and Ms. Mullins are in the bar, the shots from behind Ms. Mullins sitting down show that her left hand is on the table. However, the shots showing the front of Ms. Mullins show her arms folded. Trivia: All of the children are competent musicians, and they are all playing their own instruments. Trivia: During ending credits, when the band is playing, the actors were all wearing their own clothes. The bass player (Katie) actually had a solo as well, but the editors cut it out. Question: Perhaps a weird question but why did Patty call the cops when she found out Dewey was posing as Ned? Wasn't that ridiculous since it didn't really seem like too much of a crime - as Dewey said to Patty "it's not like I murdered anybody"? Answer: It's fraud at the end of the day. And in doing so he has put the kids at risk, and possibly ruined Ned's reputation. 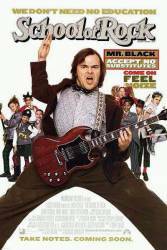 Question: I have not seen this film but have heard that at one point Jack Black sings the Bruce Dickinson song 'Tears Of The Dragon'. Is this true? There is nothing on the IMDb. Chosen answer: The song isn't on the soundtrack, and I can't find anywhere in the film where Jack sings lyrics that even sound like Tears. I don't think it's true. Question: I know this is a weird question but does anyone know how to play sticks? It is said on the DVD that the kids taught it to Jack Black and that it is a finger game but that is all we are told. Chosen answer: Sticks is a game where 2 players hold up both hands, and point one finger out of both hands. One player starts, and hits the opposing player's finger. The hand that the one player just hit then has two fingers. The 2nd player then does the same, either using the hand with 2 fingers, or just one. Once both hands get all five fingers up, they lose. But if one hand has 2 or a nother even-number amount of fingers up, they can split the 2 or 4 up, making 1 or 2 fingers on each hand.